Robert Edmond Grant was an Edinburgh-trained physician, who gave up the medical profession to study invertebrates. 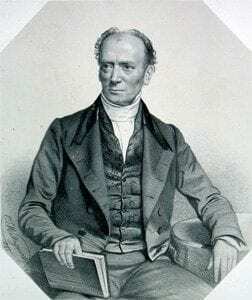 He was an early advocate of evolutionary thought (a strong supporter of Geoffroy and Lamarck and their views), and cited Erasmus Darwin’s Zoonomia in his medical dissertation. 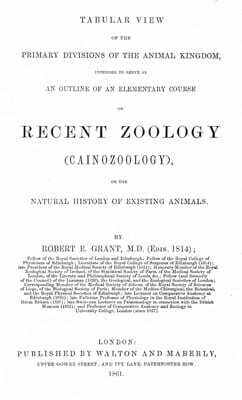 It is worth noting that Grant was mentored by the geologist Robert Jameson, now established as the author of an anonymously authored distinctly transmutationist 1826 paper “Observations on the Nature and Importance of Geology.” Early in his career, Grant traveled to Paris (multiple times between 1815 and 1820), and was acquainted with both Cuvier and Geoffroy. Grant is often memorialized as Charles Darwin’s instructor in invertebrate zoology, while Darwin was a medical student at the University of Edinburgh between 1825 and 1827. 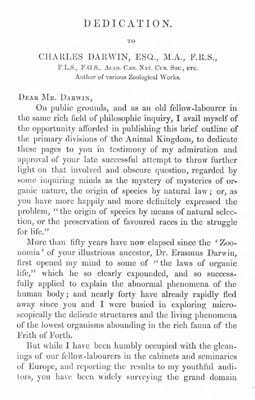 From their joint collecting trips to the shore, Grant introduced Darwin to the world of research and microscopic dissection – and this led to the Darwin’s first scientific paper, delivered at the Plinian Society in 1827. As Darwin later wrote in his autobiography, “He [Grant] one day, when we were walking together, burst forth in high admiration of Lamarck and his views on evolution. I listened in quiet astonishment, and as far as I can judge, without any effect on my mind.” Darwin’s introspection aside, Grant surely played a critical role in fostering Darwin’s love of natural history, taste for research, and willingness to think openly about transmutation. For an excellent treatment of Grant and his ideas on evolution, please read: Desmond, A. 1984. Robert E. Grant: the social predicament of a pre-Darwinian transmutationist. Journal of the History of Biology 17: 189 – 223.